Welcome To Your Complete Guide To The Maltipoo. The Adorable Maltese Poodle Mix. A popular designer breed known for its fun personality that’s wrapped in an impossibly cute, tiny package! This adorable dog combines the regal and highly intelligent Poodle (toy or miniature) with the popular lap dog known for its flowing white locks, the Maltese! In this guide, we’ll touch on where the Maltese Poodle originated, his physical characteristics and expected behavior. We’ll also investigate possible health concerns, where to buy or adopt a Maltipoo, and assess his suitability as a family pet. The Maltese cross Poodle is a designer dog breed that is the result of breeding a purebred Miniature or Toy Poodle with a purebred Maltese. Since the Maltipoo is a deliberate cross between two breeds, it’s known as a hybrid dog. Hybrids may be a perfect mix of their parent breeds, or they may more closely reflect one parent breed over the other. So with the Maltipoo, you could end up with a small Poodle-looking pup (with the Poodle’s curled coat), a slightly large Maltese-looking pup (with the Maltese’s signature long white coat), or a pup that looks like a nice mix of both. To get a better idea of what a Maltipoo may be like, you’ll need to understand its heritage. So let’s talk about the Maltipoo’s parent breeds. The Maltese is one of the oldest dog breeds out there. Ancient artwork that’s been found in what some consider to be the breed’s homeland, the Italian island nation of Malta, shows depictions of little white dogs from as early as the fifth century! It’s generally agreed upon that the Maltese descended from Bichon-type pooches that were bred as pets. Since the breed was recognized by the American Kennel Club (AKC) in 1888, the Maltese has continued to do what it does best. Perch on the lap of its beloved owner while enjoying giving and receiving affection, with a bit of play time thrown in. The Poodle was first bred in Germany as a water fowl retriever. Seems like a far cry from the elegant Poodle that we know today! Poodles eventually made it to the United States, where they were formally recognized by the AKC in 1887…just one year before the Maltese! Since then, Poodles of all sizes have been gracing the obedience ring. Showing off with their suave, highly intelligent presence. They’re also popular as interactive and playful family pets. So, what happens when you cross a small lap dog with another small, high-energy retriever type? Let’s learn about the Maltipoo’s expected temperament. As we previously established, a hybrid dog may take after one or both parents, both in looks and in behavior. For the Maltese and Poodle mix’s expected temperament, we can only make an educated guess based on the parents’ individual temperaments as well as the parent breeds’ general temperaments. 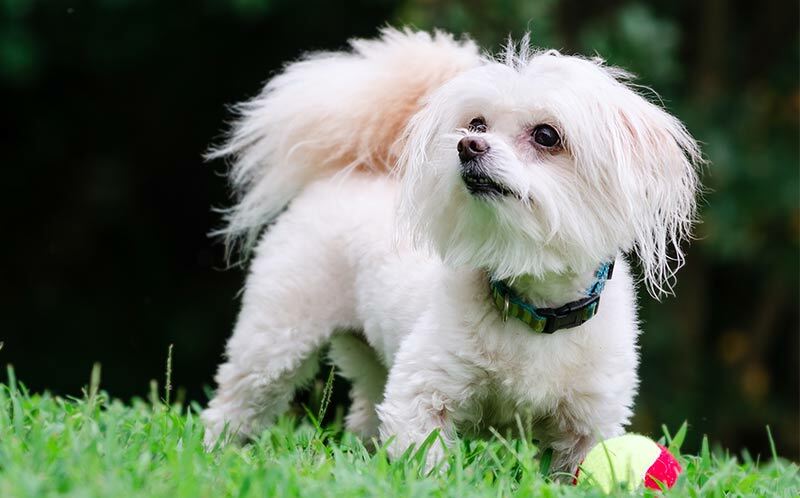 Based on the Poodle and Maltese personalities, a Maltese-Poodle mix will most likely be a lively, somewhat to very active dog that enjoys running amok. However, his personality could go one of two ways: shy or outgoing. Miniature and toy Poodles sometimes are a bit shy around people who are not their owners and possibly other dogs. As with any breed, this shyness can lead to unwanted behavior. However, social problems can usually be prevented if Poodles are properly oriented with people and animals from puppyhood. They make very loving family pets when they’ve been properly socialized. Furthermore, Poodles are very much go-go-go dogs who enjoy an active lifestyle. They benefit greatly from long walks, self-exercise, and plenty of play time. Another pretty and stoic breed, the Maltese is known as “the aristocrat of dogs” for a reason! These dogs enjoy being treated like royalty and will gladly observe their surroundings from a luxuriously cushy pillow or bed. This can lead to a spoiled little pooch if one isn’t careful! Due to their somewhat stubborn nature, you may be hard-pressed to get a Maltese to do anything without a treat. But, with a little encouragement, they have been known to make adorable little trick dogs! Finally, Maltese dogs are recommended for households with older children only – their small size makes it easier for them to be accidentally dropped or stepped on. They may also become the stereotypical “yippy small dog” due to their tendency to adopt a “watch dog” role. So, how big (or a better question may be, how small) will a Maltipoo full grown dog be? Maltipoo adults will definitely be small, but just how small depends on whether or not their Poodle parent was a Miniature Poodle or a Toy Poodle. Adult toy Maltipoos may weigh anywhere from 4 to 7 pounds and may reach 10 inches tall at the shoulder. Miniature Poodle-Maltese crosses may weigh somewhere between 10 and 15 pounds, and may reach anywhere from 10 to 15 inches tall at the shoulder. Although it’s a known fact that Poodles are indeed hypoallergenic, you can’t be for certain that a Poodle mixed breed will also be hypoallergenic, especially if one parent is not hypoallergenic. Since the Maltipoo has a shedding Maltese parent and a non-shedding Poodle parent, a Maltipoo puppy may be hypoallergenic like his Poodle parent, or he may still shed, thanks to his Maltese parent’s genes. No breeder can guarantee a Maltipoo to be hypoallergenic. If they do, then you need to walk away and find another breeder. Let’s talk about just how much shedding you can expect, should you wind up with a Maltipoo that isn’t hypoallergenic. A Maltipoo will require grooming, regardless of whether or not his coat is closer to a Poodle’s coat or that of a Maltese. If a Maltipoo inherits a Poodle’s hypoallergenic coat, then he’ll require daily brushing, at minimum, and monthly clipping and grooming if his natural coat is left to curl. You may choose to keep his coat short for easier maintenance, as curling often leads to matting when it’s not regularly groomed. If a Maltipoo inherits the Maltese’s long and silky coat, then he’ll also require brushing – weekly at least, but daily for best results. However, the good news is that he probably won’t shed too much. Like any dog, whether they’re purebred or a mixed breed, Maltipoos may develop health problems with age, or they may be genetically predisposed to certain health conditions. A few common canine ailments, regardless of breed, include hip dysplasia, eye diseases, allergies, and skin irritations. To learn more about the diseases and health conditions that have been associated with the Maltese breed, specially, refer to our article on Maltese dogs. To learn more about the diseases and health conditions that have been associated with Poodles of each size, refer to our article on Standard Poodles. In addition to the health problems that we listed in the parent breed articles above, Maltipoos are susceptible to a host of other health problems due to their particularly small size and genetics. This condition typically results from a viral infection, but it seems to be unique to some small or toy dog breeds. It results in inflammation and gradual death of brain tissue, which can lead to such things as decreased energy, seizures, blindness, and stroke-like symptoms. According to a 2014 study, Maltese dogs may have an increased risk of developing this often fatal condition. A previous study carried out in 1995 found that five Maltese dogs developed NME symptoms very similarly to Pugs who had developed and succumbed to the condition. Miniature Poodles and other selected breeds have an increased chance of inheriting and subsequently developing degenerative disc disease. This causes minor pain, at best, and total hind-end paralysis at worst. Disc slippage or rupture may result from trauma, but more often than not, it results from continuous disc degeneration that becomes more prominent with age. In Lehman’s terms, this always inherited disease results in the degeneration of the hip bones from an early age. 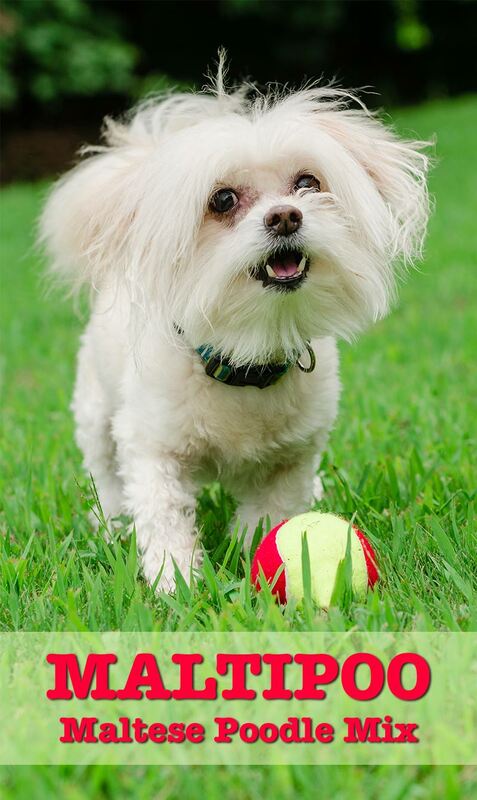 According to the American Maltese Association, the risk of carrying this disease runs higher with toy breeds. This includes the Miniature and Toy Poodle as well as Maltese, as each of these breeds generally mature to 15 pounds or less. If you plan to purchase a Maltipoo from a breeder, make sure that they test both parents to identify any genetic health conditions they may then pass to their offspring. In a 2009 study conducted by the Veterinary Medical Teaching Hospital of Seoul National University, Miniature and Toy Poodles had the highest instance of developing cataracts than any other small breed. Results from other studies referenced in the 2009 study reinforce the notion that small Poodles (and we might infer, Poodle crosses) are more likely to develop cataracts due to genetics. This risk increases with age. This is an inflammation of the eyelid that closely resembles conjunctivitis. Constant drainage may lead to loss of pigment or fur around the eye. This condition may be inherited, or it may result from allergies or infection, and it appears to be a common problem in Poodles. 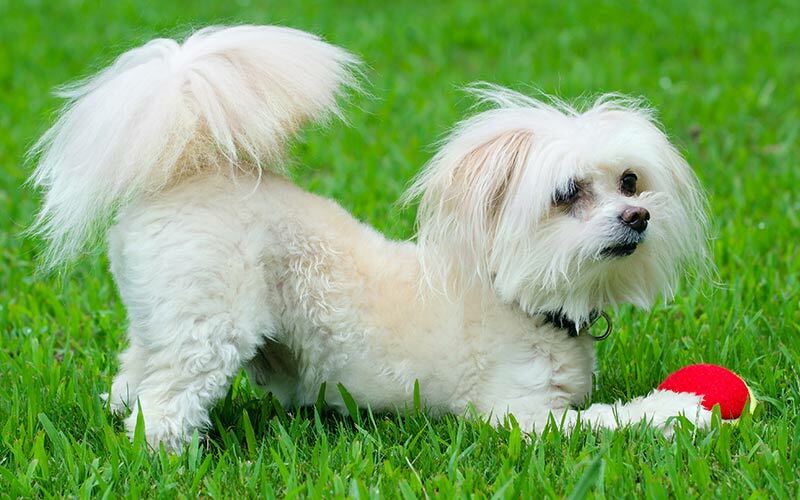 Due to their parent breeds’ increased chances of developing spinal and hip problems, it’s essential that Maltipoos have lots of opportunities for exercise each day, preferably from an early age. Exercise helps to keep dogs limber, prevents them from gaining too much weight, and helps to prevent muscles from atrophying. All of which lend themselves to increased bone strength and an increased overall well-being. Since Poodles are super active dogs and Maltipoos love to play, ensuring that your Malti stays active will not only keep her physically healthy, but also mentally healthy. That’s not to say that you can’t enjoy quiet time with a Maltipoo who has inherited her Maltese parent’s love of cuddling, but we do recommend that you play with your pup and give her the chance to self-exercise when you are away. A mixed breed dog will most likely live about as long as its parent breeds. As such, you can expect the Maltipoo to live anywhere from 10 years to 15 years. If you’re buying a Maltipoo from a breeder, the average cost for a puppy ranges from about $1,000 to $2,000. The price varies based on the parent stock, how much they are worth to the breeder, whether or not the puppies are half Toy Poodle (toy puppies are harder to keep healthy, therefore they tend to cost more), as well as their color or color combination (some colors are more sought after than others). It is essential to find a Maltipoo breeder who lets the puppies live in their home, and who has a relationship with the mother. And is not just using her as breeding stock. Make sure that both parents are friendly and welcoming. And ask the breeder for proof of all health tests relevant to Poodles and Maltese Terriers. Miniature/Toy Poodles and Maltese dogs are prone to a number of health problems, so when these breeds are mixed, it’s likely that the offspring will be at an enhanced risk of developing eye problems, dental issues, degeneration in their hips, spine, and joints, neurological issues, and/or cardiovascular issues…to name a few. We recommend genetic testing breeding stock prior to purchasing a Maltipoo from a breeder to see how likely they may be to develop any of the aforementioned inherited health conditions. Due to their increased likelihood of having musculoskeletal problems from middle age onward (sometimes sooner), you’ll want to ensure that a Maltipoo doesn’t succumb to laziness! Room to run and time to play are both requirements for a healthy ‘Poo. Since the Poodle’s coat is hypoallergenic but the Maltese’s coat is not, a Maltipoo may or may not shed. Additionally, a Malti will definitely need daily to weekly brushing, or a professional grooming and clipping once per month, depending on which parent’s coat they inherit. Furthermore, these tiny dogs may not be the best option for homes with small children, as toy breeds can be accidentally injured quite easily from being accidentally stepped on or dropped. Maltis may also be stereotypically “yippy”, especially if they are shy around strangers. However, they may have an outgoing personality – as with any mixed breed dog, what they will look and act like is really anyone’s guess! Fierheller, V. “Legge-Calve-Perthes Disease (LCPD)“, American Maltese Association. Park, S.; Young Yi, N.; Bok Jeong, M.; Kim,W. ; Kim, S.; Min Chae, J.; Moon Seo, K. “Clinical Manifestations of Cataracts in Small Breed Dogs,” Veterinary Ophthalmology, 2009. Schrauwen, I.; Barber, R.; Schatzberg, S.; Siniard, A.; Corneveaux, J.; Porter, B., et al. “Identification of Novel Genetic Risk Loci in Maltese Dogs with Necrotizing Meningoencephalitis and Evidence of a Shared Genetic Risk across Toy Dog Breeds,” PLoS ONE, 2014. Stalk, I.; Chadwick, B.; Dayrell-Hart, B.; Summers, B.; Van Winkle, T. “Necrotizing Meningoencephalitis of Maltese Dogs,” Veterinary Pathology, 1995. Ward, E. “Degenerative Disc Disease in Dogs,” VCA Animal Hospital, 2008. Yuill, C. “Blepharitis in Dogs,” VCA Animal Hospital, 2010.